One Good Thing About America will be published in a couple of weeks. 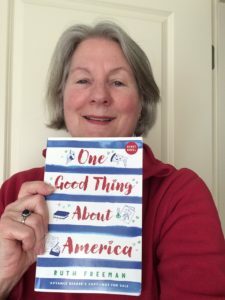 Here I am with an advance copy. And, yes, she finds many, many good things about America! I’ll be posting more soon. In the meantime, you can follow me on Facebook: Ruth Freeman Author. Blog Tour April 10 – 21!